MOWCAP-Asia Culture Center offer up to $10,000 grants for documentary heritage projects in Asia-Pacific. In the Asia Pacific region, many libraries, archives and memory institutions face formidable challenges: economic, climatic and geographic. The newly established MOWCAP-ACC Grants Program aims to contribute to addressing this challenge by assisting with the preservation of, and universal access to, the documentary heritage of the Asia/Pacific region, and also to increase awareness of the existence and significance of the heritage. 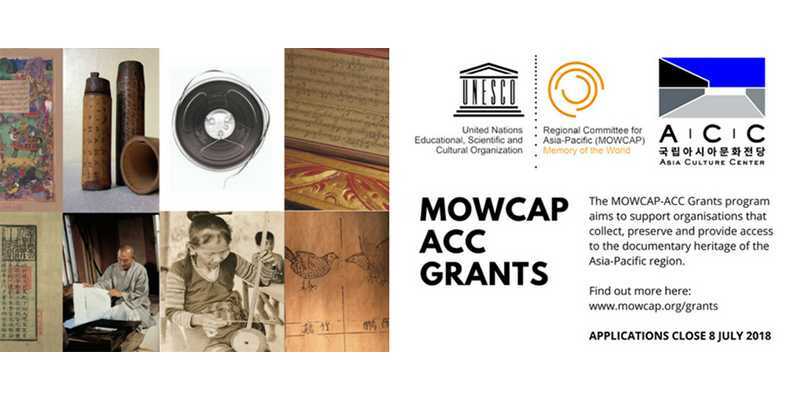 The MOWCAP-ACC grants program supports the efforts of the many groups and organisations that collect, and preserve and provide access to documentary heritage from the Asia-Pacific region. It aims to encourage collaboration and partnerships to undertake projects (eg preservation of materials, digitizing, exhibitions, publications, etc) as well as to develop skills and resources (eg workshops, training programs, expert assessments, etc). Grants of up to US$10,000 are available for the preservation and sharing of the documentary heritage of the Asia-Pacific. Grants are required to be fully expended, and the project completed and acquitted, within a sux-month period (July-December 2018). The grants are administered through the MOWCAP Office, Asian Culture Center, Gwangju, Republic of Korea. The Grants Program is made possible through the generous support of the Asia Culture Center. Applications for the grants close on 08 July 2018.